When it comes to weight loss, snacking can be a friend or foe. Snacking is inevitable, especially with today’s fast paced society. However, sometimes we encounter snacking disasters by choosing junk food rather than a more nutritious option. Protein bars are a great snack choice when losing weight, but which are the best protein bars for weight loss? Let’s see. 0 grams SUGAR: No artificial sweeteners*. Great for those watching their sugar intake (Low GI). Who Should Use Protein Bars for Weight Loss? Protein bars have come on leaps and bounds in the last few years. Behind us are the days of bars that feel and taste like cardboard or alternatives packed with sugar. The protein bar market has picked up which is a great advantage for anyone looking to use protein bars to aid weight loss. Protein is an essential macronutrient. Our bodies need it for pretty much everything! Every cell is made with protein, so it’s clear to see why getting enough in your diet is vital. When you’re dieting, your body often starts to break down muscle to use as energy. Getting enough protein helps maintain lean muscle mass and promote fat loss. Of course, the best way to get enough of this essential nutrient is to eat a diet packed with protein-rich foods. The problem is, on a calorie restrictive diet plates full of turkey breasts and boiled eggs can host a whole load of calories. Often, people rely on protein supplements as a low calorie way to meet their daily protein needs. Protein powders are very popular with fitness fans. Protein bars however, are a great alternative supplement that can make a high protein meal replacement. Meal replacement bars are typically packed with protein and fiber. This can stop a hunger pang before it starts and leave you feeling fuller for longer. They can also reduce snacking between meals – many come in indulgent dessert flavors to satisfy that sweet tooth. 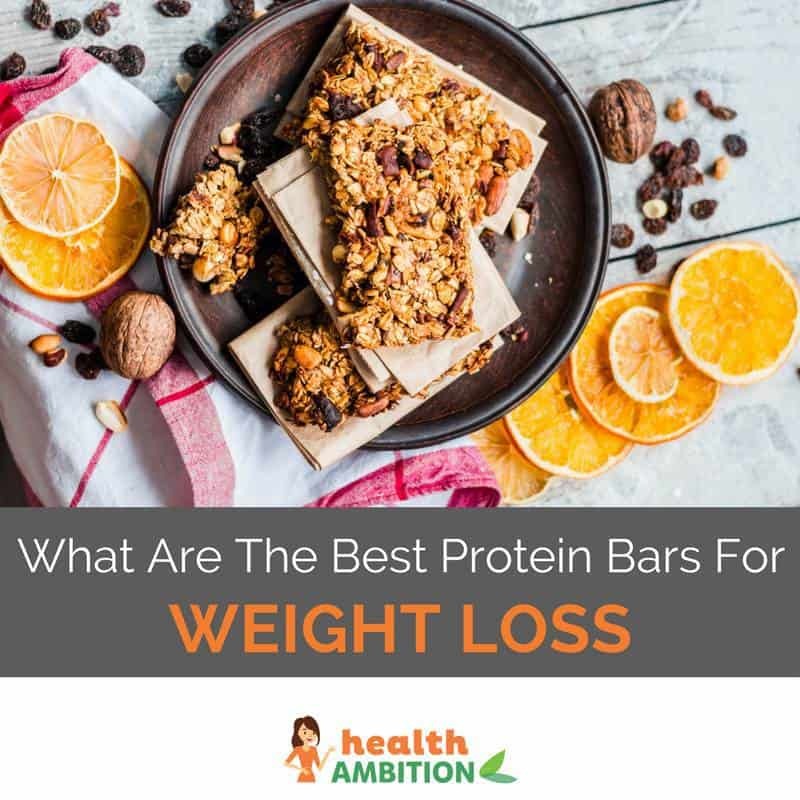 The American Dietetic Association notes that protein bars as a meal replacement are an effective tool for weight loss, when part of a well balanced diet. Protein bars made with high-quality protein, such as from animal sources, provide essential amino acids. These help build and maintain muscle mass, synthesize red blood cells, and make both enzymes and hormones. Depending on your fitness goals, protein bars can support your workout routine – giving you the boost of protein needed to maximize your results. Not only will a protein bar before the gym give you the steady flow of energy you need, but the amino acids will help repair and grow your muscles afterwards. Protein bars are super convenient. There’s no need to mix up a shake, no mess to clean up. Just throw it in your purse and go. This is especially helpful for busy professionals. The American Council on Exercise warns that you will not benefit from protein bars if you make the wrong choice. Using a high-calorie meal replacement bar as a snack can actually lead to weight gain. You should avoid protein bars which are high in calories, sodium and sugar. Your daily sugar intake should be no more than 25 grams daily for women and 37.5 grams for men. Make sure you’re not using up most of that allowance solely on a protein bar. I’ve looked at the protein bars currently available and selected five which I feel would make an excellent choice for anyone looking to lose weight. I’ve ranked each product and listed pros and cons to help you make an informed decision. At the end, I’ll leave you with my overall favorite. These high protein bars offer a huge 20 grams of protein per bar. This bar has zero sugar and is low in carbohydrates, making it an excellent choice for someone trying to slim down. The one problem with these bars is they have a very short shelf life. Check the date when you buy them and make sure to consume them before they expire. This organic, vegan weight loss bar is packed with organic whole foods and plant-based protein. 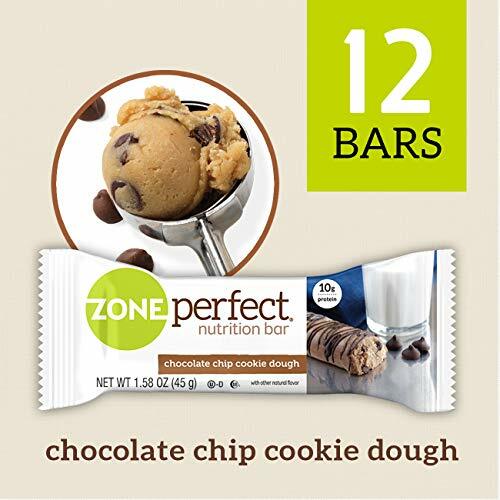 It offers 14 grams of protein per bar with less than 1 gram of sugar. The only problem with this product is that it’s quite expensive. These weight loss supplement bars offer 18 grams of protein with minimal sugar and carbs as well as all essential vitamins and minerals. The one major let down with this brand is the product melts easily. Therefore, they may not be be the best option to throw in your purse or keep in the car for a full day, which takes away a the convenience factor. 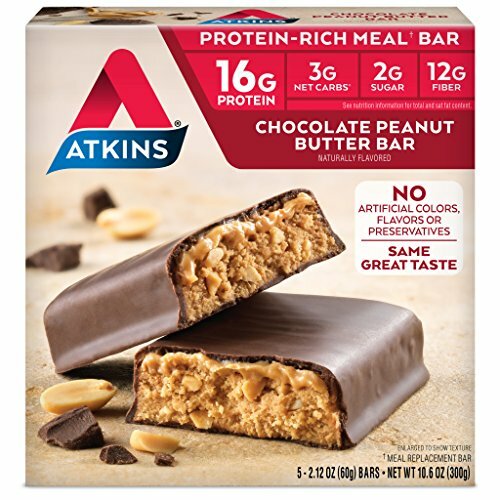 This Atkins meal bar is a protein packed bar which is solely designed as a meal replacement, not a snack. Therefore, the carbs are slightly higher than you would expect in a diet bar. However, it should keep you going for longer. It’s a good source of protein with 17 grams per bar and only 1 gram of sugar. It comes a wide range of flavors which users love. The price is reasonable too. Whenever you’re looking to buy a new product, the first thing you do is take a look at the reviews. Be it from strangers online, your best friends personal recommendation or the advice of the sales assistant in your local health food store. Getting a seal of approval for any potential purchase is a serious consideration during the buying process. This product most definitely gets that! So many people who have tried this bar are ready and willing to sing its praises. From the amazing taste to the fact it left them feeling full for three hours after breakfast. This is why I felt it necessary to include this product. However, when you take a look at the ingredients, I have to say unless you’re looking to use this as a meal replacement bar when dieting, this would probably not be the best option. The amount of protein in each bar is relatively low, whereas the carbs and sugar are quite high. 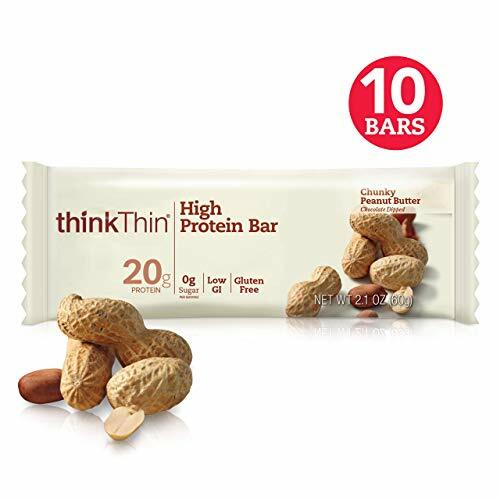 For me, the winner has to be the thinkThin bar. If you are looking for a protein supplement, the protein content is the most important factor. 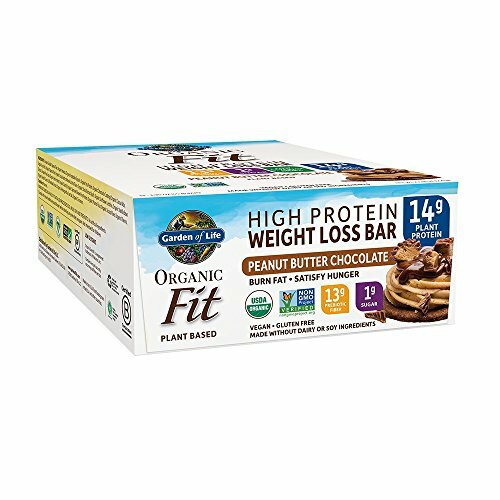 This bar offers a level of protein which rivals many protein powders, yet remains a low carb and sugar option. 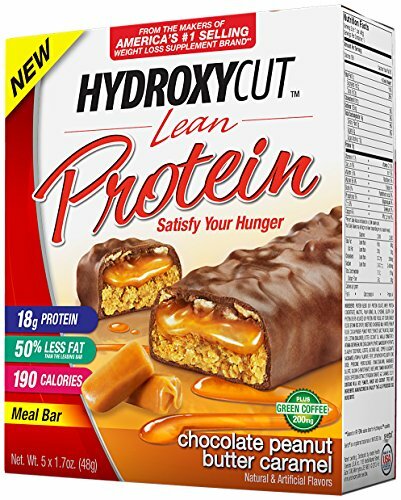 I think this product would make a good choice for anyone looking for a protein bar for weight loss. BCAAs vs Whey Protein, Which is The Best to Grow Muscles? What Are the Best Protein Bars For Women? What Are The Best Vegan Meal Replacement Shakes in 2019? What Are the Best Organic & Gluten Free Protein Bars? What Are the Best Protein Bars for Men?